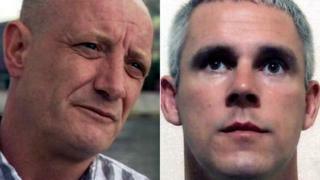 Two men have denied the murder of Merseyside gangland enforcer John Kinsella. Steven Boyle, 35, and Mark Fellows, 37, also denied the attempted murder of Kinsella's partner when they appeared via a video link Liverpool Crown Court. An application will be made in October to dismiss a further count of murdering Paul Massey - a convicted criminal once branded "Mr Big". Both men were remanded in custody and a trial is due to begin in November. Mr Boyle, of Sandiway, Heywood, Manchester, and Mr Fellows did not enter a plea in respect of the alleged murder of Massey, 55. Massey was shot five times as he got out of a car outside his home in Clifton, Salford, on 26 July 2015. Kinsella - described as a mob fixer who once stopped a gangster threatening former Liverpool footballer Steven Gerrard - was shot by a man on a bicycle as he walked his dog on 5 May 2018. Kinsella's partner, Wendy Owen, was shot at as she fled the scene at the St Helens Linkway near the M62 in Merseyside.